After rugby, handball and football, VOGO SPORT joins the Montpellier Castelnau Volley UC club. To start the year off right, VOGO is implementing VOGO SPORT for “Fans” for the Montpellier Castelnau Volley UC club. The French League A volleyball club plays at “Palais des Sports Jacques Chaban Delmas” venue (South of France), which has a capacity of 3,000 seats and is currently being expanded. The VOGO SPORT service will be launched here on Friday 18 January, during the derby match against Spacer’s Toulouse Volley club. Spectators are already invited to download the VOGO SPORT app at home. They will be able to activate it once on site, and to discover its major functionalities: live multicam, instant replay, zoom and slow-motion. By offering VOGO SPORT to its spectators, the club intends to reach a new audience, modernize the way the match is played in-venue, and bring an innovative image to the team and a new means of visibility to the partners. “Montpellier-Castelnau-Volley is very proud of this partnership and to offer a new service to its fans. 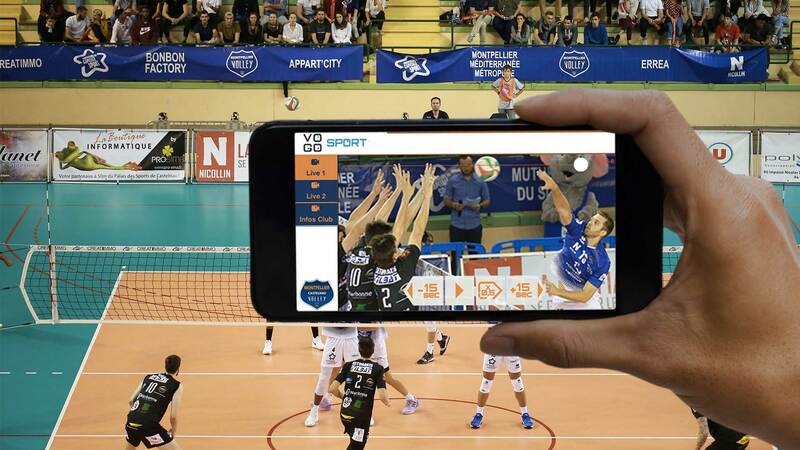 The Club wishes to develop and improve the spectator’s experience: after the implementation of the radar which measures the speed of services, the diffusion of real-time statistics, this new modern mobile app perfectly meets our dynamic strategy.” (Jean-Charles CAYLAR, President of Montpellier Castelnau Volley UC). By collaborating with the Montpellier Castelnau Volley UC, VOGO is further consolidating its leadership in Montpellier Metropolis. The company acquires a 4th club, and in the same time a 4th major sports discipline in this area. Keep informed of the Montpellier Castelnau Volley UC home matches by checking out our calendar. Whishing them a successful 2019-2020 season! Next post Football: VOGO SPORT is growing in French football and entering the Italian market!